It is not uncommon for some vegetarians and vegans to be deficient in vitamin B12. Main sources of this vitamin are found in animal products, like meat and eggs. B12 serves many purposes in the body, such as helping make DNA and red blood cells (that carry oxygen to your organs and give you energy and help prevent fatigue). B12 also helps keep your brain and immune system healthy and plays a role in preventing a type of anemia called megaloblastic anemia, which may leave you feeling tired and weak. Not only is having sufficient B12 important for preventing and fighting disease and giving your body energy, but it may also play a major role in your mental health. This information is especially relevant for vegans and vegetarians because they generally avoid animal products - the primary source of B12. In a study examining 9,668 men, conducted by the National Institutes for Health (NIH), vegetarian and vegan (there were relatively few vegans in the study, only 39) men had higher depression scores than their male meat-eating counterparts. At the time of the study, the men examined had pregnant partners, so the goal was to see if nutrition had an effect on paternal depression (currently, there is little research on this). Extensive background data and information were taken from the expectant fathers, including age, marital status, family history of depression, educational level, job status, alcohol and tobacco consumption and more. These variables were taken into consideration, and the depression scores still revealed that the non-meat eating men had a tendency to be more depressed. And this may be largely due to the lack of B12 in many vegetarian and vegan diets, according to the study. This does not mean that you must eat meat and other animal sources of food, in order to get B12. But it does mean you may have to be even more proactive to ensure you are getting necessary nutrients, such as B12, if you choose to lead a vegetarian or vegan lifestyle. And one of the ways you may be able to do this is by introducing nori into your daily diet. In a nutshell, nori is an edible seaweed commonly used to make sushi. It usually comes in the form of a dry, brittle sheet. You can also use nori to make sauces, crumble and sprinkle over a salad or add to a sandwich for some saltiness and texture. You can even sprinkle it over popcorn, and more. Conveniently, most grocery stores sell nori snacks, which are simply the sheets, meant to be eaten as a simple snack. 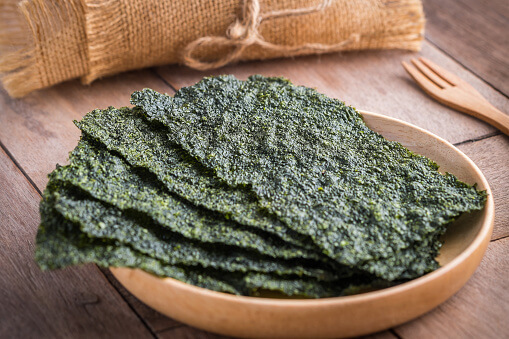 Nori is delicious plain and may help when you are craving something salty and crunchy. It’s very low calorie, as one sheet will generally cost you only about five calories. “Consumption of approximately 4 g of dried purple laver [nori] (Vitamin B12 content: 77.6 μg /100 g dry weight) supplies the RDA of 2.4 μg/day,” reports the NIH. It does not require that you eat a lot of nori, in order to get an adequate amount of B12. Protein, 1g. Your body uses protein to build and repair tissues. Protein may also help you feel full for a longer period of time, which may prevent hunger pangs and overeating. Iron, 0.30 mg. You may know an iron deficiency can cause anemia, but you may not know iron is extremely important in regards to depression. Many women are depressed during their childbearing years (25-45), and this may be because women lose iron during menstruation. There are two types of iron -- heme and non-heme. Heme iron is rich in lean meat and seafood. This is more bioavailable, meaning your body can use it better. Non-heme iron is found in nuts, grains, vegetables and other fortified products. Magnesium, 9 mg. Several studies have reported an improvement in the severity of symptoms of depression when study participants were given 125-300 mg of this mineral with each meal and at bedtime. Calcium, 4 mg. There is no clear relationship between calcium and depression. Some studies found low calcium in depressed patients and others found elevated levels. However, you cannot ignore calcium’s role because it affects the levels of magnesium in the body. Vitamin K, 65 mcg. This vitamin is very important, as it helps regulate normal blood clotting. It also helps to transport calcium throughout the body, so it is very important for bone health. Phosphorus, 17 mg. This mineral works with calcium to build strong bones and teeth. It is also needed to help balance and use other vitamins and minerals, including vitamin D, iodine, magnesium and zinc. Potassium, 78 mg. There’s a surprising connection with the liver and potassium. Liver injury or infection causes patients to urinate their potassium out. When the liver heals, the potassium levels start to go back up. This has implications for people with chronic liver problems, in terms of both diet as well as use of medications, since very low potassium levels can be more dangerous than the liver problem alone. Potassium may also help keep blood pressure under control and may even help reduce kidney stones and bone loss as you age. Vitamin C, 4mg. You likely know about the immune-boosting benefits of vitamin C, but what about this nutrient’s importance regarding aging? Click here to find out. Folate, 30 mcg. Folate (also called vitamin B9) is a very important nutrient, especially for pregnant women. Folate may also help prevent cancer and heart disease and improve mental health. A study from Harvard Health reported folate may also be useful in treating symptoms of depression. Nori is also rich in the mineral iodine. The body needs iodine for some of its most fundamental functions. Iodine can make the difference between a healthy child and one with intellectual disabilities, or between a sluggish, obese person and a lean, vibrant one. Iodine is important because it’s used to make two hormones: T4 (storage thyroid hormone) and T3 (active thyroid hormone). These are both made in the thyroid gland, located in the neck. “Low” thyroid, or hypothyroidism, can cause problems including fatigue and a slowed metabolism. Some people may develop hypothyroidism from an iodine deficiency. No iodine, no thyroid hormones. Most people get their iodine from iodized salt. In addition to nori, other meat-free sources of iodine include potatoes and navy beans. If you follow a vegetarian or vegan diet, you can also take supplements and/or eat B12-fortified foods (grains and cereals). Some non-dairy milks, like almond and rice milk, are also fortified with B12. A nutrient blood test is the only way to determine if you have a B12 deficiency. Whether you are a vegetarian, vegan or meat-eater, it is important to undergo nutritional testing to determine if you have any nutritional deficiencies. Age. As you age, it is generally harder for your body to absorb B12. Medication. Some heartburn drugs may cause a B12 deficiency. Some contraceptives. Taking birth control pills may also put you at risk. Heavy alcohol consumption. You have likely heard drinking a lot of alcohol may deplete your body of nutrients, and B12 is one of them. If you are deficient in B12, this is something you should take seriously. Being deficient in this vitamin for a long period of time may cause irreversible damage, including memory loss and nerve damage if not addressed. Other outcomes of being B12 deficient may include insomnia, difficulty concentrating, erectile dysfunction and loss of bowel and bladder control. Since it is a water-soluble vitamin, it is difficult to consume too much B12. You generally urinate excess. As always, talk to a competent healthcare provider or doctor about dietary needs whether you decide to be meat-free or not. Be sure to mention any medications you are taking. Remember, your body and mind are intertwined so your diet will likely affect both!